The 20 largest bicycle sharing systems in the world. 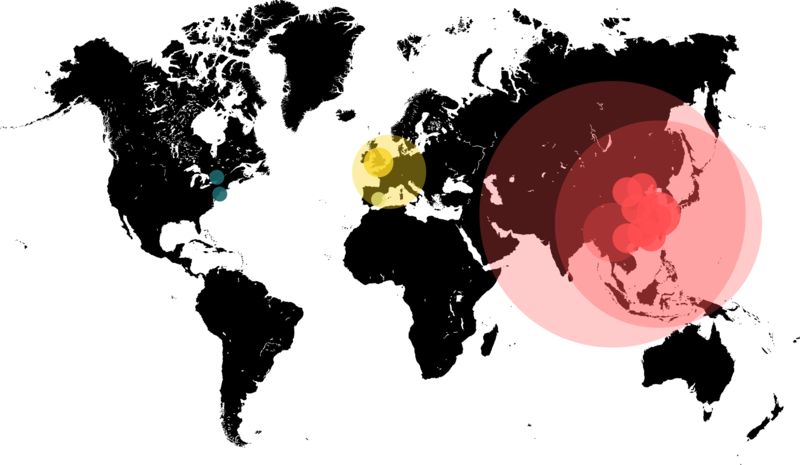 Three are in Europe (Paris, London, Barcelona), two are in North America (New York and Toronto), the other 15 are in China. Data: Earth Policy Institute, 2013! Over the last 100 years, urban transportation may have experienced two revolutions in the way it is powered, structured and managed. The first one is the generalisation of underground rapid transit systems — tube, subway, métro — i.e. a subterranean mass public transportation network relying on electricity. The second revolution, in the post-war economic boom, was the intense growth of personal motorised vehicles such as cars. While the development of the first one is more than even on the agenda, the latest—though still very much alive—is not considered anymore as a sustainable policy when it comes to urban transportation. Now comes the third revolution. In the last ten years, thanks to a significant outbreak in information technologies (IT), cities have experienced a genuine shift in the way their transit systems are structured and the way urbanites commute in their neighbourhoods. This is due to the extraordinary boom of sharing systems, as in bicycle sharing systems. To show how they are much more than gadgets for blasé urban dwellers it is important to analyse why and how they constitute a growing trend in urban transportation infrastructures. In 2000, there were about 4,000 shared bicycles in the world, and they were all in Europe. In 2013, the Earth Policy Institute estimates that more than 500,000 shared bicycles are now used everyday around the world, constituting a 13,000% increase. Europe possesses 24% of the world fleet, while North America has 3%, and Latin America and Middle East each have 1%. Astonishingly, Asia, and this is especially true in China, went from the total absence of bicycle sharing schemes in 2006 to representing 71% of the world fleet with more than 300,000 bicycles. With around 90,000 bicycles, Wuhan in the Hubei province of Central China, is the largest network in the world. Meanwhile, the Parisian scheme Vélib' offers the best ratio of bicycle per inhabitant, with 1 bicycle per 97 inhabitants. Bicycle sharing systems allow a city to add another layer of 'public' transportation to its matrix. A network of bicycles hubs are installed throughout a perimeter, each of these hubs possesses a self-service machine allowing you to subscribe a short-term membership for instance. Each of these hubs offers a certain amount of bike slots, ideally half of these slots has bicycles available (allowing the user to check out a bicycle) and the other half stays empty (allowing the user to return their bicycle). 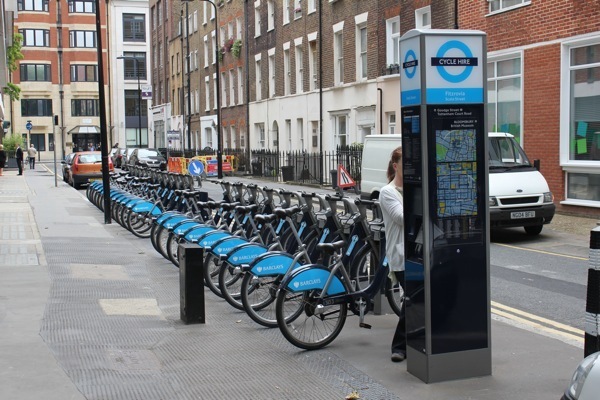 'Modern' self-service bike-sharing schemes are designed for short distance journeys. After paying a fee for a day, a week or a whole year, most of them then allow a 30 minutes ride at no extra-cost with a price increasing exponentially if you keep it for a longer period of time. For instance, in London, a journey between 30 minutes and 1 hour costs £1, while a journey up to 2 hours will cost you £6. A yearly membership costs $99 (€72) in New York, £90 (€110) in London and in Paris €29. Why is it more than a gadget? It is often attributed to Paris of having relaunched the latest generation of bicycle sharing schemes, though the first experimentations are to be found in Denmark and the Netherlands in the 1960s and 1970s. In France, Lyon was actually the first 'modern' bike-sharing scheme implemented, but the Vélo'v was quickly outpaced in fame and in figures by its Parisian spin-off. Like many cities, Paris, London and New York have to deal with a congested transport network— above and below the surface—with major traffic jams on the road and packed—often delayed— subterranean public transports. While it is not easy to drastically change the road design and even more difficult to upgrade the underground transit networks, bicycle sharing schemes are a relatively cheap and easy to implement solution to provide city users with another transport alternative. Moreover, these schemes are an excellent example of 'green' transportation and they have great positive externalities as they will stimulate a shift in people's behaviour towards transport. Thus, in London a recent survey revealed that 49% of the Barclays Cycles users started cycling in London thanks to the scheme. In Paris in 2013, 6% of the journeys are made cycling, against 2% in 2001. Obviously, bicycles did not wait the latest developments in information technology to be shared, but IT allowed the development of bicycle sharing schemes at a reasonable cost and on a scale unseen before. In terms of information technologies, two features are key in the development of bicycle sharing schemes. First, from the backend point of view, a network supported by IT help technicians identify geographical areas and bicycle docking stations with not enough or too many bicycles. Thus, they can analyse usage patterns and regulate the stocks of bicycles available, in real-time. The second feature is by far the most essential whilst it is also the one we take for granted: self- service. Self-service docking stations allow the users to pay for a membership, withdraw the bike and eventually return it. Self-service is the key, it allows the bicycle hubs to be used 24/7 and at a minimal cost. Finally, the development of smartphones, which happened pretty much within the same decade, is a great tool to be used in association with the bicycle sharing schemes. The users can access pretty much the same information as the engineers regulating the available stock. 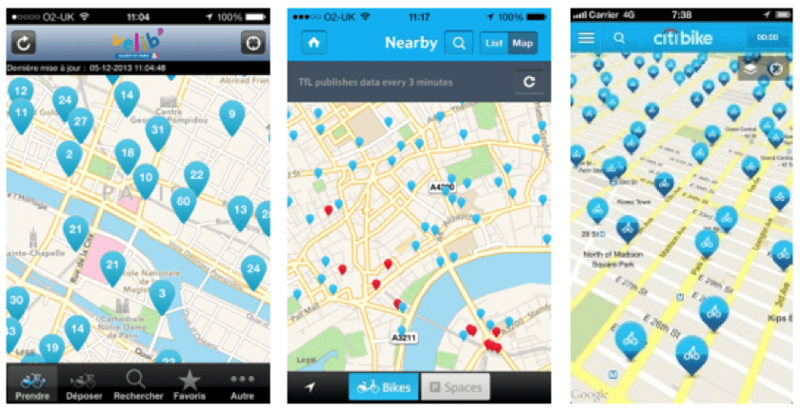 First the user can locate the closest bicycle hubs, then check if bicycles are available or if a dock is free for them to return the bicycle. The relationship between smartphone devices and self-service bicycle sharing schemes is very productive and allow what most of the other urban transportations are incapable of providing, a real-time information on availably. There is a great probability the strong trend which saw the number of bicycle sharing schemes skyrocket throughout the world will pursue its course, especially as it accompanies another significant trend: the 'Copenhagenization' of cities, i.e. the policy of promoting bicycle as a sustainable and flexible urban transportation. 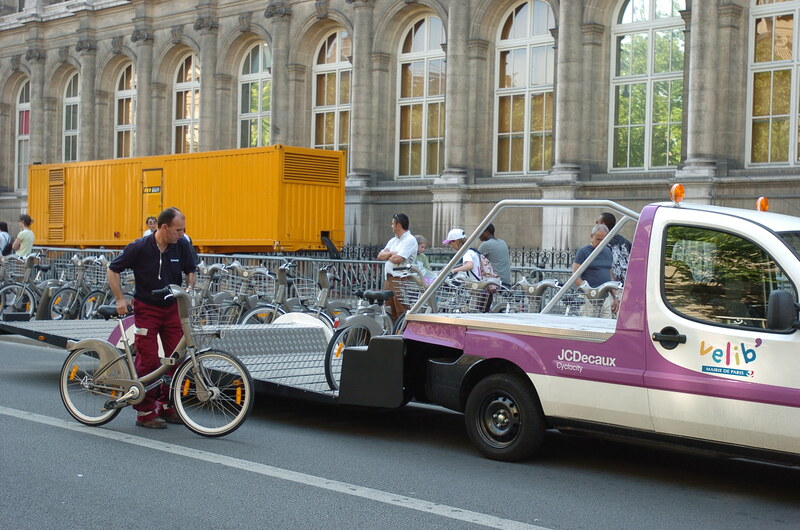 But vehicle-sharing schemes do not have to stop at bicycles. On the 4th of December 2013, Paris celebrated the second anniversary of its self-service electric car sharing system: Autolib'. Operating with a similar design to Vélib', though not on the same scale, Autolib' is taking systems such as ZipCar to the next step by providing self-service electric cars, with pick-up stations situated on the street, with vehicles the user can simply pick up and return in the same way as a bicycle. Vehicle-sharing schemes—may they be bicycles, motorbikes or cars—are a striking example of an excellent interaction between IT, smartphone devices, users and urban transportation. The result is a highly flexible extra layer of transportation, at a reasonable cost, which acts as a trigger in generating larger trends in terms of transport behaviour and sustainability in the city. These are 'smart cities' at their best.